Then – Upon the 100-year anniversary of the end of World War I we recognize five Urbana brothers who served in that war. This is a 1918 photo (#0648) of William Egan Sr. and six sons, five of whom served in World War I. 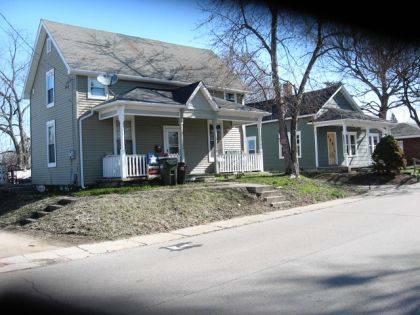 The photo was taken in front of their home at 154 W. Light St., Urbana. From left to right are Richard, who was too young for service; Frank, U.S. Army; Henry U.S. Army; Joseph, U.S. Marine Corps; William Jr., U.S. Navy; John, U.S. Army; and William Sr., who kept the home fires burning while awaiting his sons’ return. (Urbana Daily Citizen, June 24, 1976) Of the sons who served Frank was the youngest and John was the oldest. Sergeant Joseph Egan was injured while serving in France. As reported in the Urbana Daily Democrat on November 5, 1918, Mr. Egan, during a recent Liberty Loan campaign, was presented a service flag containing five stars representing his five sons who were in the service. Undoubtedly Mr. Egan was extremely proud of his sons for their service in World War I. Now – 2018 photo of 154 W. Light St., Urbana. The Champaign County Historical Society strives to highlight historical people, places and events throughout Champaign County. We therefore ask that if you have photos of historical significance that you believe would be of interest to Champaign Countians, please contact us at 937-653-6721.
https://www.urbanacitizen.com/wp-content/uploads/sites/36/2018/05/web1_ThenWeb-2.jpgThen – Upon the 100-year anniversary of the end of World War I we recognize five Urbana brothers who served in that war. This is a 1918 photo (#0648) of William Egan Sr. and six sons, five of whom served in World War I. The photo was taken in front of their home at 154 W. Light St., Urbana. 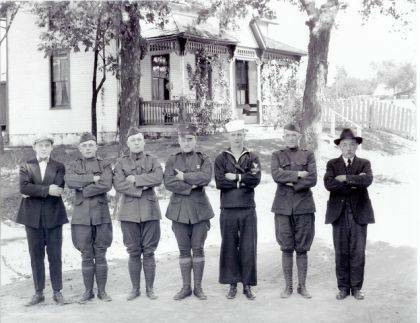 From left to right are Richard, who was too young for service; Frank, U.S. Army; Henry U.S. Army; Joseph, U.S. Marine Corps; William Jr., U.S. Navy; John, U.S. Army; and William Sr., who kept the home fires burning while awaiting his sons’ return. (Urbana Daily Citizen, June 24, 1976) Of the sons who served Frank was the youngest and John was the oldest. Sergeant Joseph Egan was injured while serving in France. As reported in the Urbana Daily Democrat on November 5, 1918, Mr. Egan, during a recent Liberty Loan campaign, was presented a service flag containing five stars representing his five sons who were in the service. Undoubtedly Mr. Egan was extremely proud of his sons for their service in World War I. Photos courtesy of the Champaign County Historical Society. https://www.urbanacitizen.com/wp-content/uploads/sites/36/2018/05/web1_NowWeb.jpgNow – 2018 photo of 154 W. Light St., Urbana. The Champaign County Historical Society strives to highlight historical people, places and events throughout Champaign County. We therefore ask that if you have photos of historical significance that you believe would be of interest to Champaign Countians, please contact us at 937-653-6721. Photos courtesy of the Champaign County Historical Society.